"A Wall Unto Us" - The Raunds Roll of Honour, cover price £6.99. It's a 200 page publication consisting of 162 one-page biographies, many illustrated, including 26 Raunds casualties not named on the town's War Memorial, a history of the War Memorial, appendices on related topics and a fully cross-referenced index. "Life Went On" - The Raunds Great War Diary, Volume 1, 1914-16, cover price £7.50. 240 pages, including 10 pages of photographs, telling the story of life in Raunds and its surrounds during the Great War. Read about the celebrations and tribulations of Rance folk during the war to end all wars. Includes a fully cross-referenced "Rance Index" and "Raunds in 1914" map. "Life Went On" - The Raunds Great War Diary, Volume 2, 1917-21, cover price £7.99. 240 pages, including 10 pages of photographs, continuing the story of life in Raunds and its surrounds during the final years of the Great War and the first three years of peace that followed, up to the unveiling of the town's War Memorial on The Square in October 1921. Again including a fully cross-referenced "Rance Index". "Ecton Not Unmindful" - cover price £10.00. Tells the story of the men from Ecton, near Northampton, who fought in World War 1, both casualties and survivors. c) By E-Mail Order, worldwide (with electronic payment). 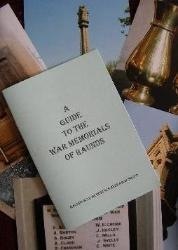 ADDENDA & CORRIGENDA to "A Wall Unto Us"
Our first publication "A Guide to the War Memorials of Raunds", a free of charge, 12 page booklet detailing the 50+ war memorials and 7 war graves to be found in the town, is still available either in traditional "paper" form or as a pdf attachment.